Father Michael Rodriguez of El Paso, Texas defending marriage. 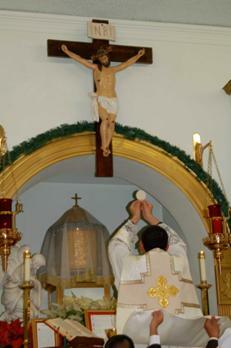 At the webpage of San Juan Bautista (St. John the Baptist) Catholic Church in El Paso, Texas there are links to homilies by Father Michael in both English and Spanish. There are also more videos of Father Michael at the JmjhfProductions YouTube channel. Here is a short video of San Juan Buatista Church. God has given us some good priests. Let's be thankful for that. It is up to the Church to elevate men with the same devotion to Christ as Father Michael Rodriguez to become the bishops that lead the flock. St. John the Baptist, you leapt in the womb at the presence of our Lord. You were his first witness. You made the path straight for him. You paid the ultimate sacrifice with your life in defense of marriage. Pray for us. Ora pro nobis. Thank you for posting this. It is like a ray of sunshine amidst gloomy news. Although, come to think of it, there are many reasons to be hopeful. In Fr Arminjon's book, he writes that some of the greatest saints will live during the last times. We may not be living in those times but, rest assured, God will send true laborers into his harvest in times of persecution. Anonymous. I didn't recognize the reference to Father Arminjon at first. I had to look it up. You're referring to the book The End of the Present World. Susan Conroy, who translated it from French to English, was on Johnette Benkovich's "Women of Grace" show on EWTN recently discussing it. She mentioned that this book was a favorite of St. Therese of Lisieux. We are definitely living in a "time of tribulation". Father makes an excellent point about how Catholic teachings on subjects like angels that are in conflict with secularism are downgraded by many within the Church. The result is that young people end up going to exotic religions in search of spirituality, when the full teachings of the Catholic Church are replete with spirituality. It's only the stripped down protestant-ized version of Catholicism that is empty and needs to search out social causes in order to seem "relevant".